Homemade tacos beat the restaurant versions on all counts. My recipe has 37% less calories than a similar version from a fast food restaurant. Approximately 25% left on the plate. A quick lunch or dinner recipe with lots of variations. 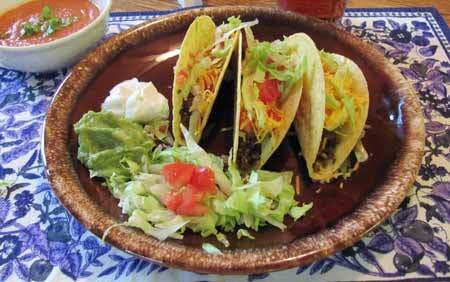 My collection of easy ground beef recipes includes several variations. This one has diced potato in the filling. 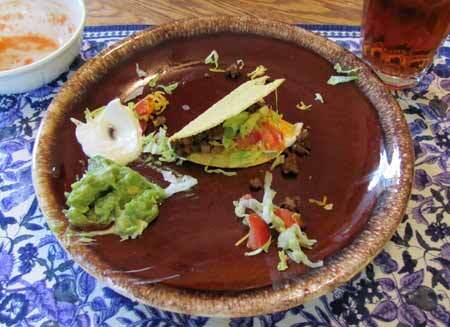 Use lean ground beef, corn shells and omega rich guacamole and this is part of a healthy diet plan. Make this or a similar portion reduction everyday for a year and lose 9.8 pounds with no other diet or exercise changes. The same portion size from a restaurant can easily be 600 calories! Make the switch from restaurant to homemade, save 224 calories or enough for a 23 pound weight loss in a year. Your choice, order from a drive-thru or homemade. Look for "fat free" refried beans in your grocery story or make your own. Mash up a can of pinto beans, add seasonings and chicken broth for the right consistency. This is not the traditional way of preparing this dish, but seasoned correctly is very good. High in fiber, nutrients, almost no fat and very low in calories. Sprinkle with a little grated cheese and chopped green onions. Try it.